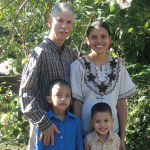 My wife Jackelin and I have planted a church called: Capilla del Calvario Emanuel where I am Sr. Pastor. We have regular services Sun, Tues, Thurs, & Saturdays. Where we teach sound Bible studies, Jackelin is in charge of the Children’s ministry where she teaches them about Jesus and gives them a hot cooked meal. We also have a FM radio station called “Radio El Shaddai”. I also am responsible for repairs of radio transmitter at another Christian Radio station called Radio “Emanuel” with Missionary Kent Aslett. Both stations transmit live broadcast, sound Bible teaching & praise music every day. Needs: Financial donations to finish Church building project, keeping our children in Christian school, keeping our used car repaired, we give to the poor in our church, our health, we pay out of pocket for Doctor appointments and pay for medicine, we live by faith trusting in God to meet our needs. © 2019 ©2014 by Pulsar Media.